Metlako Falls in the Columbia River Gorge of Oregon State offered a unique setting to push the limits of the K-1's pixel shift technology. This is a conventional single exposure utilizing no Pixel Shift. Pentax K-1, HD Pentax D FA 24-70mm F2.8 ED SDM WR 70mm, F20, 0.3 sec, ISO 100. The Gorge located along the Columbia River just outside of Portland Oregon was my first stop. The main goal for this trip was to test out the different Pixel Shift shooting modes, but I also wanted to get an idea of just how hard I could push this camera in real life circumstances. The weather wasn't optimal in terms of hiking but it definitely gave me a leg up in terms of shooting waterfalls and really testing the dynamic range due to the cloudy and rainy weather. My fiance and I started the 3 hour drive down to the gorge at around 8am on a wet and gloomy Saturday morning and thankfully traffic wasn't too terrible so we made fairly good time. We arrived at Eagle Creek trail in the early afternoon and proceeded to make our way down to Metlako and Punch Bowl Falls located about 2 miles along the Eagle Creek trail head just outside of Portland, OR. 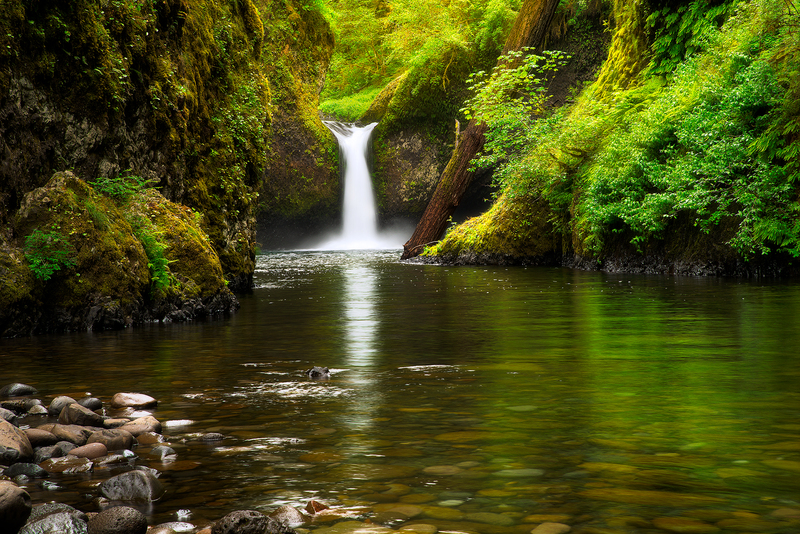 Most of the Eagle Creek trail is carved into some fairly steep cliffs and snakes its way back along the deep river valley that lies several hundred feet below the trail. There are a number of beautiful spots to take in the views and two waterfalls (Punch Bowl and Metlako falls) to make the trip more than worthwhile. The weather conditions were, well, pretty miserable. My fiancé and I experienced moderate rain throughout most of the day which definitely put a damper (literally) on the trip. It's clear that the Pixel Shift Resolution shooting modes make a huge difference to image quality from our studio tests, but how does that translate to real world shooting situations? In previous iterations of this feature (in the K3 II) we found that movement within a scene could cause major issues during Pixel Shift Capture. So if leaves rustled in the wind or your subject moved in any way the camera compensated poorly for the movement, which then resulted in pixel blur and artifacts in the regions where the movement occurred. Like the K-3 II, Pixel Shift on the K-1 takes four separate exposures at single pixel increments; however, the K-1 now offers a 'Motion Correction' option. If movement is detected in subsequent images, the camera is supposedly able to differentiate pixels that have changed from the first frame and clone in pixels to cover that area from the first frame of the 4-shot capture. In theory, this should produce a much better final product then was possible in the Pentax K3 II. To determine just how much the technology has improved in the K-1 over the previous iteration, I took the camera out into the field to really push the limits of the Pixel Shift Resolution shooting modes. I converted the resulting files in both Adobe Lightroom (my Raw converter of choice) (using ACR 9.5.1, which Adobe has confirmed represents final support for Pixel Shift) and also SilkyPix, which is bundled with the K-1 (although not the latest version SilkyPix 7.0). Our first stop was Metlako Falls located about a mile from the trail head. The access trail to Metlako is poorly marked, so it's definitely easy to miss if you aren't careful. I chose this waterfall because it offers an excellent opportunity to examine not only how the Pixel Shift deals with movement but also detail resolution, since the waterfall is surrounded by dense and lush foliage. The following widget contains files that were shot at 70mm and an aperture of F/10 to limit the effects of diffraction and to really give you a sense of the detail resolution that is possible with the Pixel Shift mode turned on. Using the widget below you can examine files converted using Adobe Lightroom, Silkypix, and out of camera JPEGs. We're showing files taken with Pixel Shift turned off, and with Pixel Shift turned on with Motion Correction enabled. As you see there can be significant benefits to shooting with the Pixel Shift Resolution mode turned on (note that SilkyPix applies significant sharpening by default, which we chose to not turn off). The detail in the foliage is much better with Pixel Shift, and a nearly 2EV theoretical increase in dynamic range means greater latitude for Raw processing of contrasty scenes (in reality, the advantage appears to be somewhere in between 1EV and 2EV). While files from our movement-free studio scene look great when run through ACR, our waterfall images (converted in the same way, using the same software) show very unpleasant color artifacts. SilkyPix does a much better job, and there's no sign of any false colors in the same areas in files converted through the K-1's bundled software. However, while there's no crazy false color, even in the out of camera JPEGs and Raw images processed using SilkyPix you can still see some issues with pixel blur where movement took place (mostly in the foliage surrounding the waterfall) as the four frames were captured. This can lead to some strange cross-hatch artifacting. And when it comes to landscapes, finding truly static shooting environments can be difficult, if not impossible. With that said, if you process your Pixel Shift files through SilkyPix, the end result might be good enough (depending on the amount of movement you're dealing with) that cloning or masking in rough-looking areas via your favorite post processing software becomes an option. Interestingly, sometimes SilkyPix does an even better job of motion correction than the camera JPEG engine itself. In fact, much of the image is quite usable in the SilkyPix conversion, but if you're the kind of person that desires the detail Pixel Shift brings, you'll still find yourself cloning out motion artifacts in many regions for a scene like this one. If you don't mind JPEG output, you can also retroactively add motion correction in-camera to an image shot with Pixel Shift. After applying the Pixel Shift to the file, you can export it as an out of camera JPEG. With that said, I don't know too many landscape photographers that shoot in JPEG or want to produce out of camera JPEGs, since they're mostly un-editable from a post processing standpoint. You're probably better off using SilkyPix, with all the caveats that brings (more on that later). There's another benefit to Pixel Shift we briefly alluded to: since information from four Raw files are essentially combined, noise is decreased. It's not that frames are averaged, but that 4x as much total light is collected and used in generating the final image, which decreases relative shot noise. This suggests a nearly 2 EV theoretical increase in dynamic range (ignoring read noise), and indeed a significant improvement is evident in the +4 EV pushed shots below. The non-pixel shift file still shows respectable noise performance in the shadows thanks to the very high dynamic range sensor, and the Pixel Shift file is even cleaner. While it's not quite a 2EV advantage, the Pixel Shift files in our studio dynamic range tests look better than the standard shots despite a 1EV relative underexposure. Hence, we'd estimate a benefit of somewhere between 1 and 2 EV. When it comes to Pixel Shift Raws, ACR is unable to cope with any sort of movement that may have occurred in the short time that the K-1 takes to capture the four separate files. Color artifacts and cross-hatching result in areas of motion, although the rest of the image experiences a significant detail increase. ACR doesn’t support Motion Correction at all. So (for now, at least) Pixel Shift and ACR simply don't mix. SilkyPix, on the other hand, handles Pixel Shift Raws in a different manner from ACR, which alleviates the color artifacts that we see in the files processed through ACR. It can also interpret the Raws shot with Motion Correction activated and produce a final image with far fewer motion artifacts - sometimes doing an even better job than the K-1's in-camera JPEG engine. Digging a little deeper, we've found that only the first of the four exposures taken during the Pixel Shift process is used to mask in problem areas when the Motion Correction setting has been enabled (in in-camera JPEGs or SilkyPix conversions). This makes sense - comparing the four files to find the sharpest one would be too computationally intensive to be practical - but it does mean that if the first exposure should happen to contain the most blur, results might not be optimal. Punchbowl Falls, Columbia River Gorge, OR. No Pixel Shift modes enabled. The amount of detail in the Pixel Shift files is markedly better than those taken with the mode turned off, but for landscape work (assuming anything short of totally still conditions) artifacts caused by movement in the scene can still cause issues. I'm glad that things aren't quite as bad as we feared from looking solely at the output from Adobe Lightroom, but even the SilkyPix version 7.0 software shows some movement artifacts in Pixel Shift files. And, at least for Mac users, SilkyPix is not the most stable or easy to use software out there. 9 out of 10 times we tried to use it, we got an unusable image preview even at 100% - making editing cumbersome, if not impossible. Capture One and DxO Optics Pro don't currently support the K-1 or Pixel Shift (e.g. on the older K-3 II) at all. The reality, then, is that Raw shooters wanting to take advantage of Pixel Shift for scenes with motion will have to resort to (the buggy and cumbersome) SilkyPix. That's a real limitation, but not an insurmountable one - you can perform rudimentary processing in SilkyPix and then output a 16-bit TIFF to continue processing in Lightroom or Photoshop. In absolutely perfect shooting conditions though (macro, portrait, and some telephoto work), the K-1's Pixel Shift shooting modes can offer outstanding results. The OOC JPEG and SilkyPix Raw images below depict a (mostly) static cityscape, and the real-world detail resolution is very impressive when movement isn't a factor. It is worth noting, however, that if there is a chance of any movement occurring in the frame I would definitely recommend backing your files up with non-Pixel Shift exposures so you can choose to mask areas in using post processing tools or choose to use the non Pixel Shift files.